Imagine a life full of blue or red balloons, dogs that wear golden crowns, flying hearts, little black men in street signs, sunglasses wearing elephants, cheeky video game characters, cherubs who carry devil horns... When travelling to a location, one wants to see the hotspots – the Tour Eiffel in Paris, the Colosseum in Rome, the Tower of London, the Brandenburg Gate in Berlin and the list goes on. But what about all the street art that is out there? Some call it vandalism. Vandalism according to the Oxford dictionary is: Action involving deliberate destruction of or damage to public or private property. When I travel I hunt for street art and I see it as art. Next time when you see street art as vandalism, think again. Please, it tells you so much about a place. Art according to the Oxford dictionary is: The expression or application of human creative skill and imagination, typically in a visual form such as painting or sculpture, producing works to be appreciated primarily for their beauty or emotional power. Street Art started as a subculture by people who wanted to change things. Thanks to all the brave creative makers out there, who intrepidly deliver their works of art. It is simply genius to make art available to the general public, and to craftily use street art as a platform to demonstrate what challenges a society has to tackle. It became more and more accepted and mainstream over recent years, and with that it often leaves public or private property unscathed. Towns or communities who wish to make streets more attractive for locals and visitors commissioned street art. That way previously neglected areas of towns start shining in a new light and are turned into friendly hubs of activity with cafes, bars and parks. When I walk with friends through Berlin, most tell me that they can’t do anything with Street Art. Some experience this art form as too loud and too aggressive. I love that Street Art creates the opportunity to be suddenly able to hear other people’s (the artist's) thoughts. In recent times I notice that brands use street art to promote their wares, clever, but that is somehow selling out the intention of street art. But it is probably just the way it is, we will wait and see what will happen next. Paste-Ups Image on paper glued to objects. Stencils The artist sprays/paints over a template. Sticker art Designed stickers get glued on objects. Yarn bombing (guerrilla knitting): Crocheted or knitted installations. 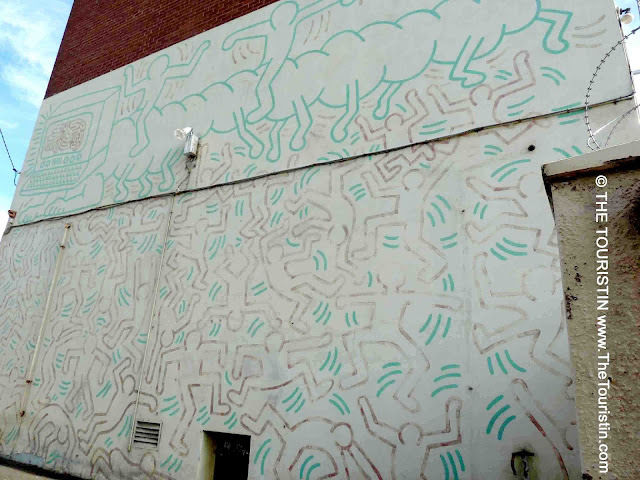 By now everybody knows that the American Keith Haring and the British Banksy (assuming he is British, male and only one person and not a group of artists) are among the very best street artists in the world and there will forever be the people who tell you what piece of art is worth it and which is not. They are probably right, but be brave, see what you like and find out which piece of street art speaks to you. Here are a few ideas of how to look at street art. It is an art form itself to interpret art, true. I imagine that some artists have an exact idea of what they want to say with their work whereas others probably just go with the flow. Find the piece of Street Art on an object. Think about what is shown. What is the first thing that comes to your mind, when looking at it? Street Art most often talks about what is happening around us and how artists experience and interpret that. Look closely and see whether the piece in front of you can tell you a story and what emotions does it evoke. Which and what kind of technique, paint and colour has been used? How much effort and labour did the street artist put into it? Was the help of assistants or machines needed? Street Art raises questions, if you feel like you want to know more about the history or political situation of a place, start visiting museums and reading books about a topic, dig deeper. The environment certainly has an impact on the work, look at street art and imagine a certain piece would have been painted on the street you live in, it might become a different piece of art elsewhere. Does the artist want you to take any action; are there any hidden or probably even obvious messages? Fresh Street Art Tour Paris. Paris, France. Street Art London. London, UK. London Graffiti and Street Art Tour. London, UK. Shoreditch Street Art Tours. London, UK. Where the Wall. Bristol. UK. Street Art Barcelona Tours. Barcelona, Spain. Lisbon Street Art Tours. Lisbon, Portugal. Bogota Graffiti Tour. Bogota, Colombia. Melbourne Street Art Tours. Melbourne, Australia. Street Art Museum Amsterdam. Amsterdam, The Netherlands. In the very end, whatever it is that you see is what matters most. Each piece of art is a great conversation starter. For the future I hope that artists keep street art political and won’t be too influenced by their audience and just create what looks pretty... or gets the most likes on Instagram.